This is another transformation based on one in my illusion cartoon story. I did it to see whether I could devise an adventure, set in graphic world, with transformations that are forbidden in our everyday world as the events that take the story forward. Most of the transformations, like this one, offer an escape route for a character being pursued. Not very imaginative. I did also have animation in mind, and working out this particular 3D morph would be no joke. It’s based on the four sided version of the famous impossible triangle, with added extensions for the towers, as above. 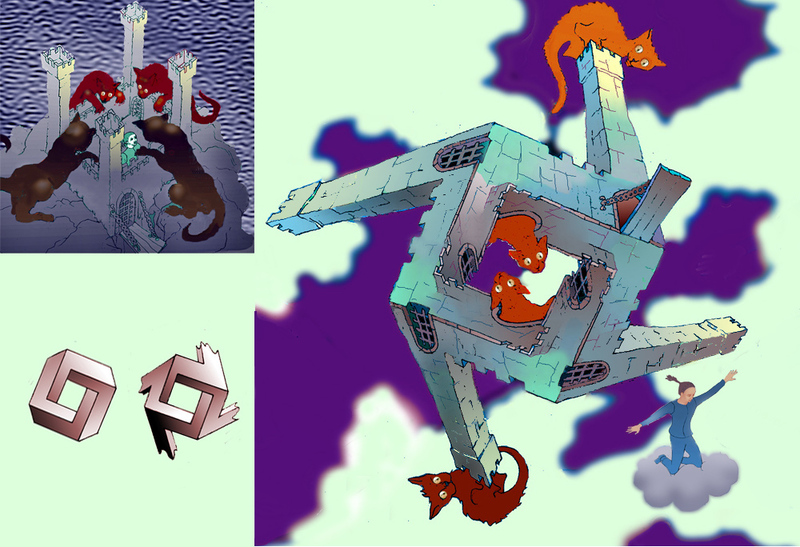 For the classic impossible tribar, see my earlier post on Escher’s Waterfall Explained. For impossible figures with four sides and more, check out Gershon Elber’s site. Previous PostTonal contrastNext PostLamp falling over!